This is book 2 in the New York Times and USA Today bestselling paranormal romance Accidentally Yours series. "If you love her, set her free. If she comes back, she's yours. If she doesn't...Christ! Stubborn woman! Hunt her down, and bring her the hell back; she's still yours according to vampire law." - Niccolo DiConti, General of the Vampire Queen's Army.After a three-century "time out," legendary vampire Niccolo DiConti vows to fulfill an ancient prophecy and, along the way, defeat the demented queen of the damned. 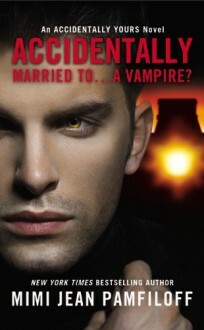 All he has to do is find his human mate, seduce her into agreeing to become a vampire, and bond her to him forever. Luckily, he's handsome, charming, and mind-blowing in bed. How hard could this be? On vacation in sultry Mexico, biologist Helena Strauss makes the discovery of a lifetime when she meets Niccolo-and finds herself caught in a world of supernatural secrets and dangerous delights. Even more shocking is that he seems to know everything about her and claims her as his true immortal companion. Sure, she can't take her eyes-or mouth-off this gorgeous, perfect being. But can a hot-blooded gal like her really settle down with a cold-hearted vampire? 90,000 words..